As spring blooms in every corner of my town, these eye catching rose macarons beautifully bloom with perfect feet in my oven. My overwhelming happy heart because I can add more collection for my macarons flavor. And proudly I can pass another macarons baking without fail. And you better start to find some new friend to enjoy them together. Or... maybe you start thinking to make money by selling them among friends and relatives.. why not? Macarons is very expensive here. Once I tried to buy from local patisserie at one mall, I must paid 25 TL (Turkish lira) for 4 small macarons! Just convert it to your own money. And for me nothing so special about that macarons I bought but they came with nice pastel color which I like, that's all. And it was too sweet for me. Long long time ago when I was visiting my sister who lived in Kajang, Malaysia at that time, I remember I ate macarons at Kuala Lumpur, in one cafe inside petronas tower. . . I remember I ate chocolate macarons with chocolate filling. The tart was perfect and the sweet was just balanced with the bitterness of the chocolate. And that was I think best chocolate macarons I ate until.. I can bake it by my self.. lol. Well.... just go to your local market to grab some almond meal. Then go to your kitchen to start baking them by your self. 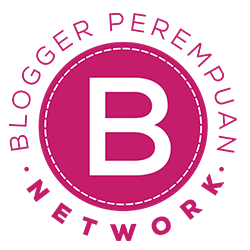 You will get cheap yet yummy macarons without flying to France. What I like about yogurt cake is very simple and quick to make. Like this fresh strawberry yogurt cupcake I made today. The cake was so fresh with fresh strawberry chunk inside yet fluffy and moist cake. Every evening after dinner we-like other Turkish family- always have our Turkish tea time. 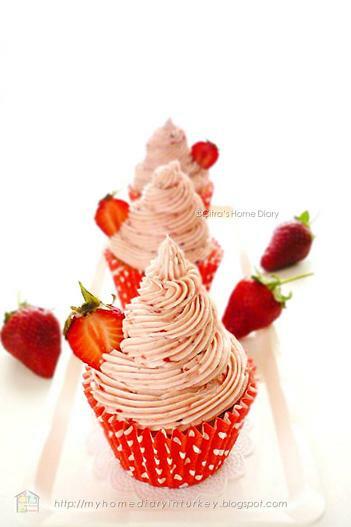 For me drinking tea without any snack along with it, is just not like my style, so these strawberry cupcake are perfect for our tea time cake in front of TV. For the complete beautiful touch I made fresh strawberry butter cream icing for garnish and enrich this tasteful strawberry yogurt cupcake. But if you want to skip the butter cream it's okay, replace it with some strawberry or lemon icing glaze. They are still tasty as should be. Ikan means Fish in Indonesian. Saus Lada hitam means black pepper sauce. 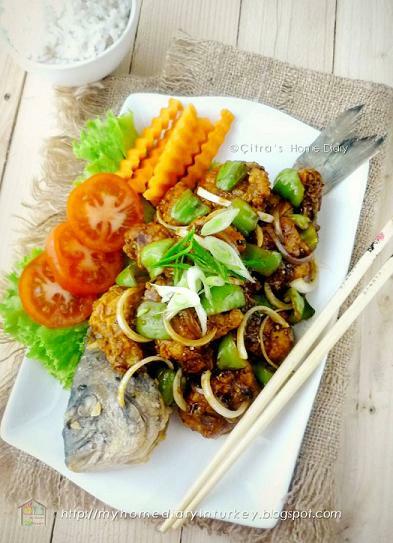 The humble of lightly crushed black pepper corn mix with oyster sauce and ginger-garlic spices is a fusion of Indonesian flavor with chinese influence. The sauce mixture in this dish make it so special and really gets along with fish or any seafood you cook with this sauce. Eg, crab, calamari, lobster or prawn. This dish is one of popular as street food along with other kind. If you were live in big city like surabaya, jakarta and some other cities, you might find some Chinese food street vendors along the main street open their "kitchen" after afternoon. And also you can find at some Indo-Chinese restaurants which open mostly almost 24 hours. But even it's popular as street food, still some moms-like my mom- sometimes cooked it for us at home. Usually she use crab for this black pepper sauce. Yes, this black pepper sauce is just perfect for crab. And since I couldn't find any crab until now in Bursa I want to fulfill my craving on some my homaland food like this crunchy fish cooked in black pepper sauce. 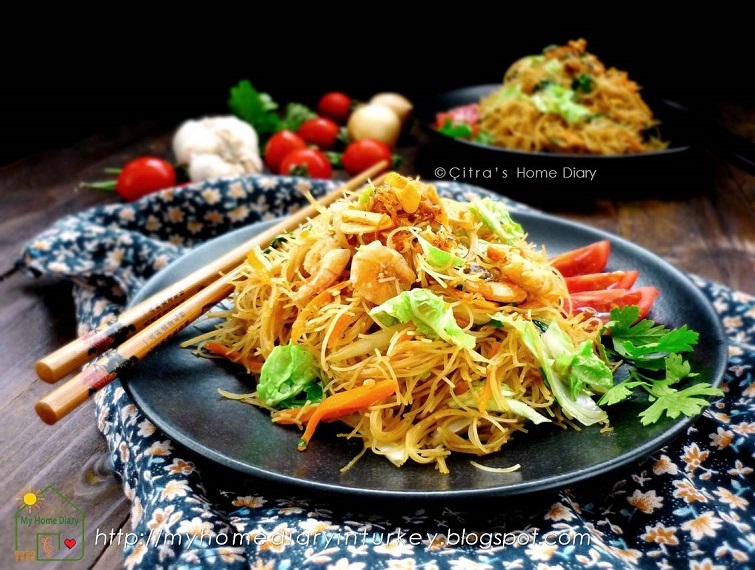 Making it is actually very simple and quick for prepare-as many type of Indo-chinese food. Köfte is a meatbal made of ground meat, lamb or beef. However it can be made without any meat, like patetes köftesi ( from potato) or mercimek köftesi (lentil). The word köfte is sometimes preceded by the name of a town, which refers to the technique for cooking it or the ingredients or spices specifically used in that region, for example; İnegöl köftesi, İzmir köfte , Akçaabat köfte, pideli köfte (Bursa), Filibe köfte, Tire köfte, Islama köfte (mainly in Sakarya province) etc. It's main ingredients are minced meat, parsley, bread-egg (not necessarily, usually homemade köfte contains egg yolk and some crumbled bread) and a range of spices: cumin, oregano, mint powder, red or black pepper powder with onion or garlic. Kadınbudu köfte is another traditional speciality; minced meat is mixed with cooked rice and fried. Içli köfte can be described as a shell of "bulgur" filled with onion, minced meat and nuts. Çiğ köfte is a meze from south-eastern Turkey meaning raw meatballs, prepared with "bulgur" and raw minced meat. 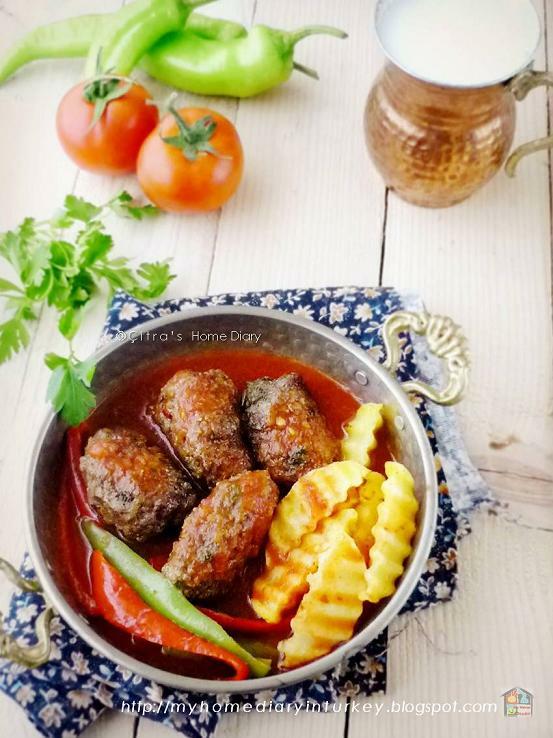 Terbiyeli Sulu Köfte is another meatball speciality cooked with flour, tomato paste and water in which lemon and egg sauce is added. And today I made İzmir köfte or famed köfte from Izmir. İzmir is a metropolitan city in the western extremity of Anatolia and the third most populous city in Turkey, after Istanbul and Ankara. It is one of the most westernized cities in Turkey. 30 degree Celsius rainy day today. Something that exactly reminds me of my homeland. I love summer! I feel like energizing during summer. And nothing is more festive the summer than bright and colorful fruits and vegetables on farmer market. And did I mention barbecue time at open air with friends and family? Picnic and barbecue time is officially open by nature..! Just like previous years, we just prepare some Turkish meatball / köfte and some chicken with local taste and flavor.. almost always same. So I wanna try new thing to prepare for next barbecue. 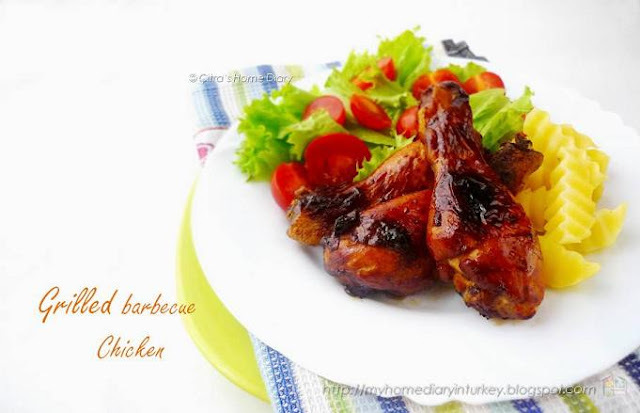 This is actually my old fave back when I was in Jakarta, grilled barbecue chicken thigh. 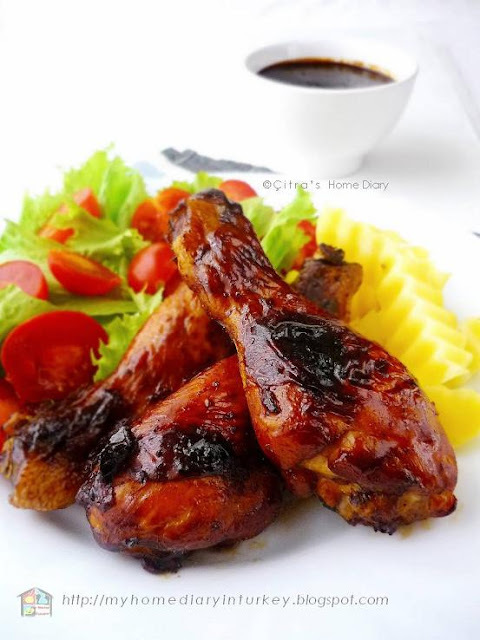 I used to ate this barbecue chicken (sometimes ribs) at least once in a week in one of cool restaurant in Rasuna Said at that time. So today I wanna try to make it in home first for preparation next week barbacue. But today I made this for our dinner 1st and I wanna see my husband's impression whether he like it or not. The recipe I adapted from Jamie's Oliver barbecue ribs with minor adjustment base on my prefer and ingredients I have. But since I adore these little fancy adorable sweets cookies (who doesn't?) I start to open my next chapter of my next new macarons flavor. And talking about new flavor of my next macarons, I have very very long list on my mind. So please visit my page more often to find out what's gonna be next. French sweets? Well here a bit of history. Macarons have been produced in the Venetian monasteries since the 8th century A.D. During the Renaissance, Catherine de' Medici's Italian pastry chefs whom she brought with her in 1533 upon marrying Henry II of France arrived in France. Larousse Gastronomique cites the macaron created in 1791 in a convent near Cormery. In 1792, macarons began to gain fame when two Carmelite nuns, seeking asylum in Nancy during the French Revolution, baked and sold the macaron cookies in order to pay for their housing. These nuns became known as the "Macaron Sisters". In these early stages, macarons were served without special flavors or fillings. These adorable cute cookies are a really fancy delicacy. No, they’re not easy to make. Yes, they require time, patience, and practice to master. But it’s really worth it, and making them at home is way less expensive than a plane ticket to Paris. 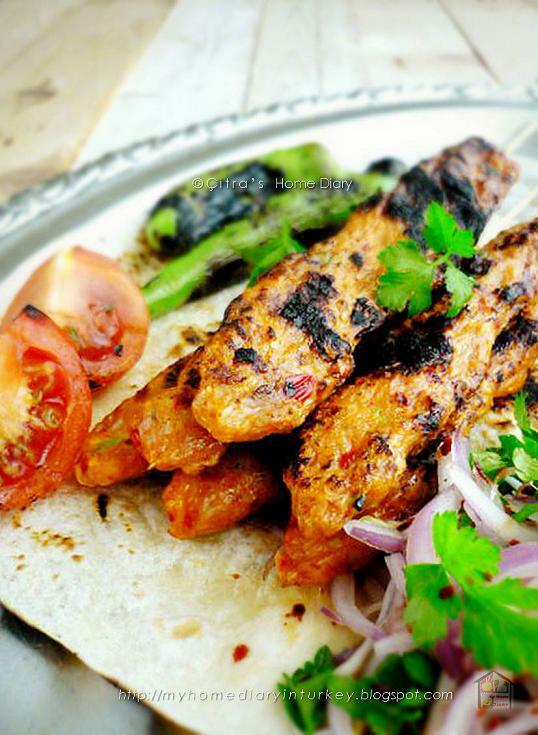 Kebap (in Arabic: کباب) means meat that cooked directly on fire (charcoal or wood-burning oven) or within a pot. (However, what we understand from today's definition kebab is that it includes tomato and pepper). In Sumerian language, the word kebab is derived from ''kabuba'' word meaning roasting. According to the some of the sources, kebab is a general definition for the Arabic-origin meat dishes. From these explanations, it's told that kebab comes to Anatolia from peasants who immigrated to Adana from Arabic countries to cultivate. According to the comments of the experts, people's waiting for the meat to be cooked around the fire when fire was found and used to cook meat, i.e. when the kebab was being cooked for the first time formed a basis for table culture. Even mostly kebab cook over grill, there are also some stew kebab just like tas kebab or meat kebab with stew. 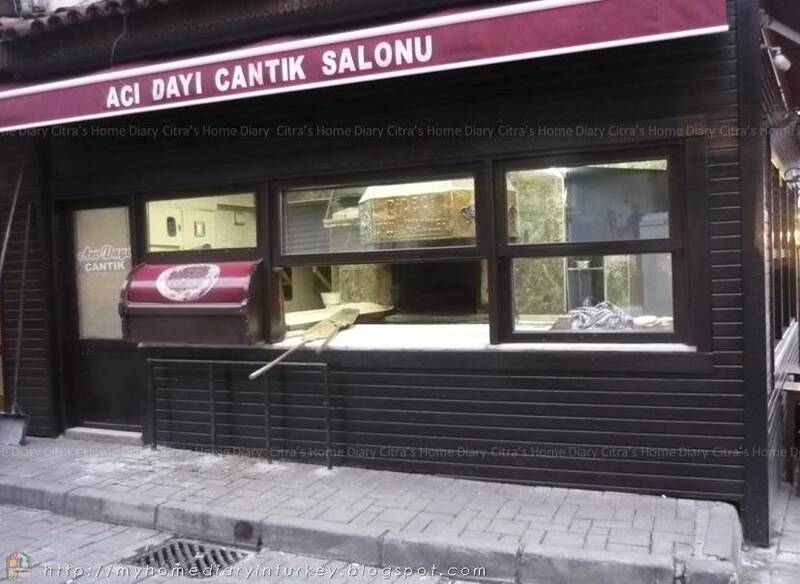 In Turkey there are many.... I mean MANY! kind of kebab varieties. The list would be very long if I mention by one by one. But what I will share today is one kind from those many I said. It's Chicken sish kebab. 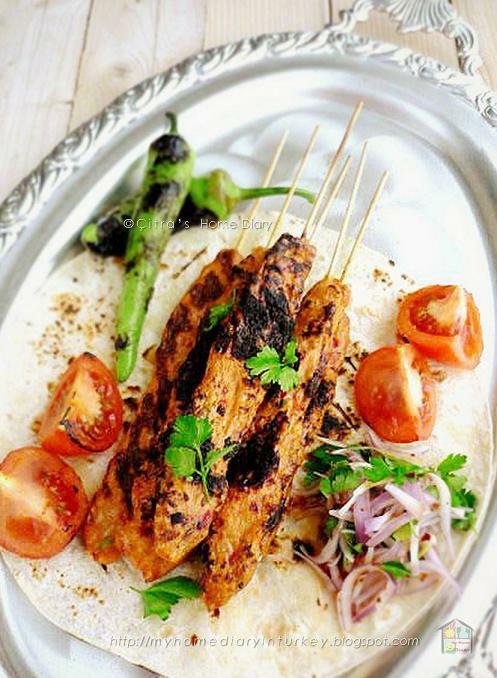 This delicious chicken kebab was inspired by famed Adana kebab. But I made it from chicken instead of lamb/ beef. But be sure this would be your new favorite list. 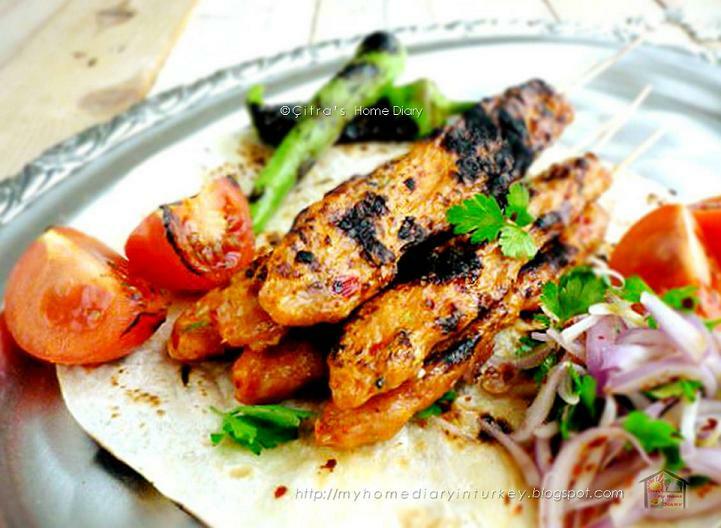 It's summer knocking the door..... and this yummy chicken kebab is a great meal to celebrate it. Take it for out door barbecue picnic with your family and friends. Or just prepare it ahead for special weekend dinner/ lunch! So here you go if you wanna experience the real taste of kebab. Macarons, is a french sweet meringue-based confection made with egg white, icing sugar, granulated sugar, almond powder or ground almond, and food colouring. The macaron is commonly filled with ganache, buttercream or jam filling sandwiched between two cookies. 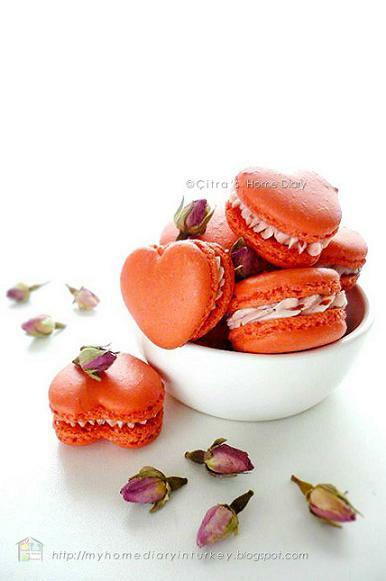 The name is derived from the Italian word macarone, maccarone or maccherone, the meringue. Even basically these people fave just made with 4 ingredients plus food coloring (if using), now we can find many ideas of variety for this macarons. Like adding cocoa powder in it to make chocolate macarons. Or adding some Asian taste by adding matcha or pandan flavor in it. 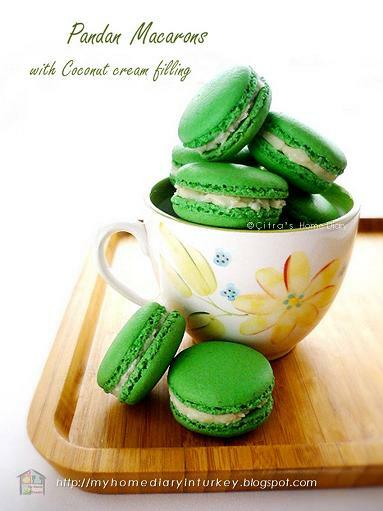 And if you are my regular reader, you should know that previously I made new favorite; coconut macarons. 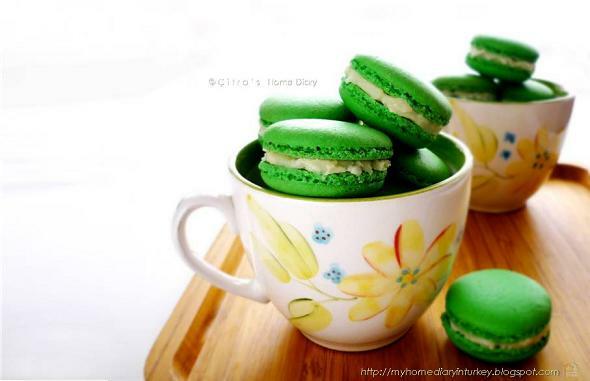 In case you missed my other macarons recipe, you can check at "Macarons" category list. And part of my obsession to make macarons' variety as many as I can, today I made black sesame seed macarons. 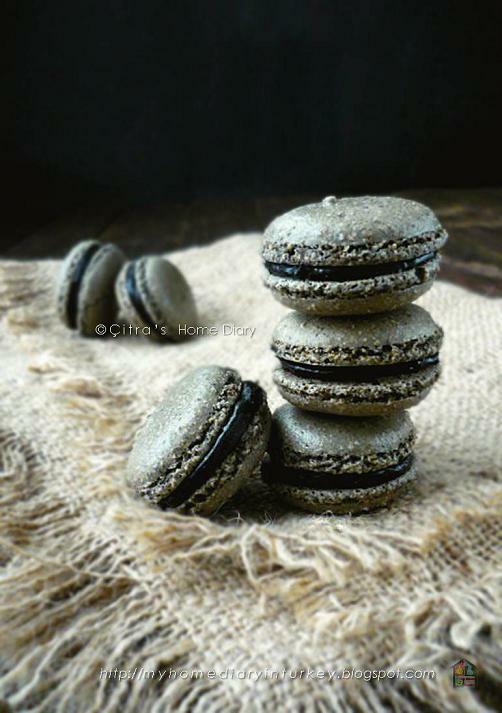 Some of you maybe already familiar with black sesame seed macarons, meanwhile some of you never heard about it and wondering how it make and taste. Yup..me neither ^,^ I never tried black sesame macarons before. That is why I am so curious about it. When I search for black sesame macarons recipe on the net, I found some of them used 100% black sesame seed for their nut-free macarons while other using ratio for almond and black sesame powder. So for my black sesame macarons today I'll stick to my base recipe with a little modification adding black sesame powder. Oh, btw... I make my own black sesame powder by grinding some black sesame seeds in spice grinder. Sift few times to get smooth powder. Bring back the coarse one to grinder to process until you get smooth powder. But be careful not to work it too long otherwise you'll end up with oily and gritty powder. Next time I will post how to make black sesame seed powder in separated post, this time I didn't take picture of it. My today post is my favorite dish; Kari ayam or Indonesian chicken curry. This kari ayam I served on my family dinner table together with famed roti jala. In case you missed my roti jala recipe, you can check it here. Kari or curry is one of the diversity of Indonesian food. This dish believed derived by Indian influence to Indonesia. Read more about Indonesian cuisine at bottom part of this post. We have many kind of curry "bumbu" version too. "Bumbu" is the Indonesian word for spice or seasoning, and it commonly appears in the names of spice mixtures, sauces and seasoning pastes. Beside variation from ingredient used like chicken, lamb, beef or vegetables, curry "bumbu" also has some variation, eg. green curry, red, or yellow curry. Different from other region (like North Sumatra and Riau Islands) where they serve it with roti jala, in Java mostly we eat this curry with steamed rice together with chilly sambal and cucumber or pickle. 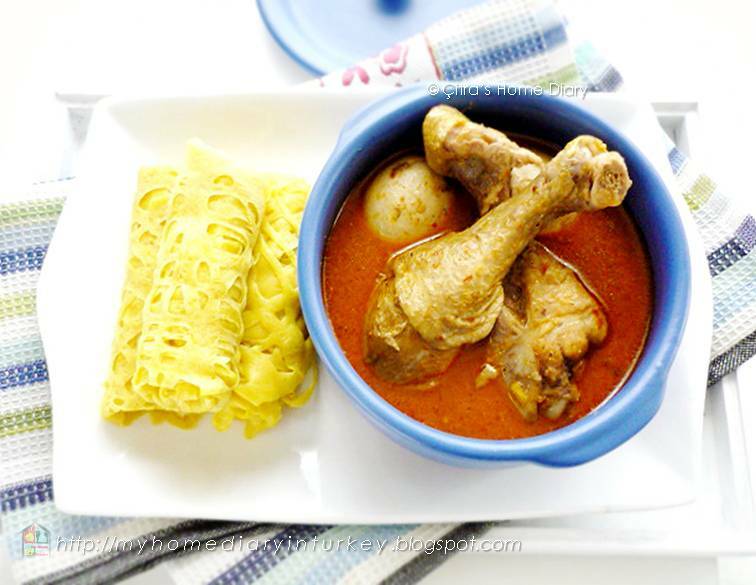 Roti Jala (also known as Roti Kirai or Roti Renjis), literally meaning Net Bread is a pretty dish that looks like a lace doily due to the way it is made. In Indonesia this dish derived from the North Sumatra. Since geographically it closes to Malaysia so many Malay influence on that province including culture and culinary. 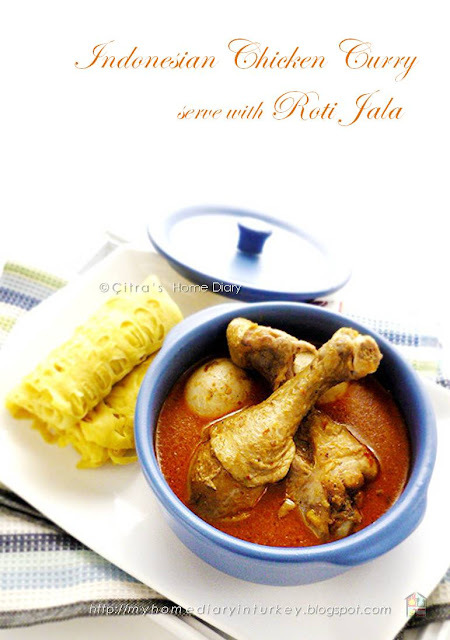 Roti jala usually is served alongside with curry dish/ curry sauce. In Deli (Deli Serdang Regency) they serve it with famed lamb curry together with pickled pineapple. 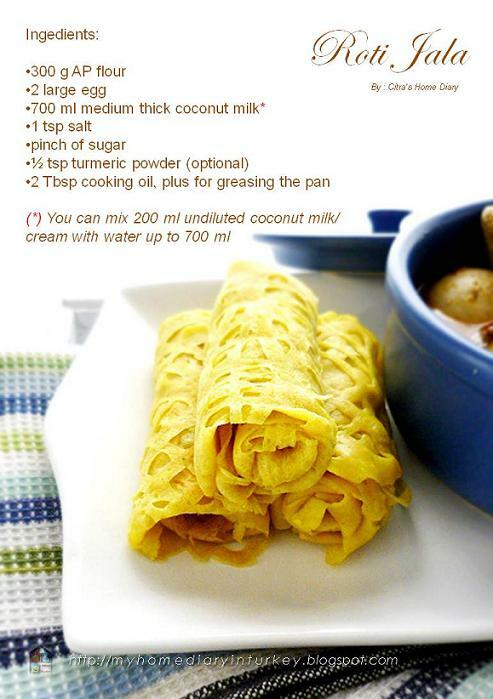 According to the humanist M Muhar Omtatok, roti jala or net pancake is Malay food which could have been adapted from Indian element. Roti jala also found in Riau Islands known as roti kirai. And that's my friend what I am going to share today on my blog. Yes, Indonesian culinary is very rich and colorful due to we have many ethnic groups (more than 300) living from east to west Indonesian archipelago. Indonesian cuisine varies greatly by region and has many different influences. I made this roti jala to serve with my chicken curry, you can check my recipe here. But sometime I eat roti jala with different dipping sauce. Make slightly sweet version to go with your fruits jam or chocolate sauce, that's another ideas to enjoy roti jala. 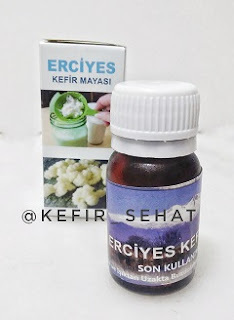 Selam Everybody... Merhaba from Turkey.. Spices is part of my culinary life. I am Indonesian with thousand of authentic spices on our foods enrich the flavor. We use spices almost in any meals. From herb drink, dessert until our main dish. So I love and enjoy spices in my meals. 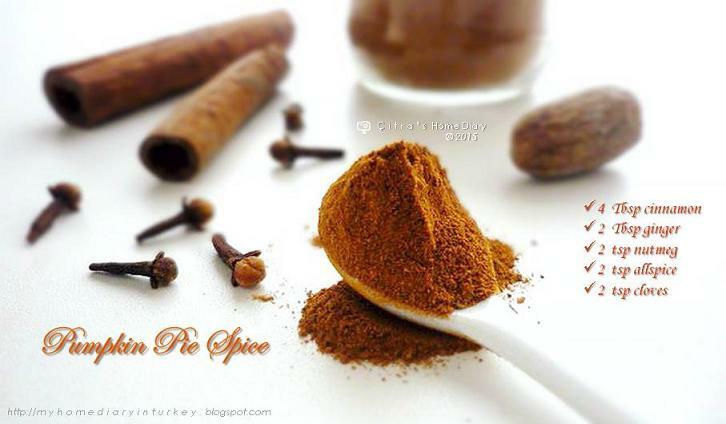 We also have few basic spices for our main dish.. like you know Chinese spice or Moroccan spice basic that you can blend in many ways. Talking about spice, my today post is pumpkin pie spice. It's famed spice blend which mostly people use to make pumpkin pie. The spices definitely enrich the pumpkin and twists it into delicious fave pie. If you search along the net you'll find many variation ratio of it, it really depend on your prefer how your spice will suit you. 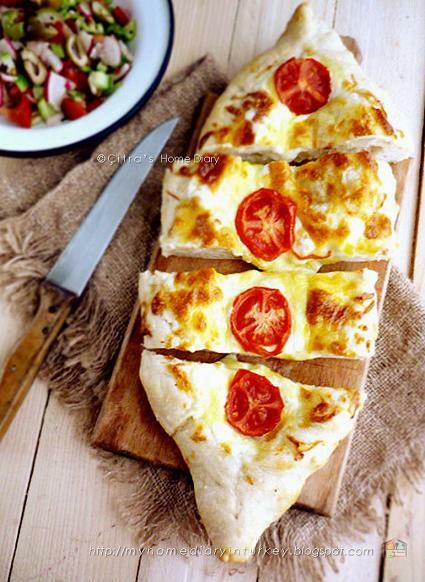 Same as bread, pide is a staple dish in Turkey. People eat pide anytime, anywhere. Pide is a Turkish pizza look a like-with Turkish flair. It has chewy texture compare to pizza which more 'bread-y'. With typical distinctive charcoal aroma from traditional stone oven pide easily can be found in every corner in Turkey. The topping and filling can be vary in each regions. If you are my regular reader you should already know very well that I made and post many pide recipes. Because as I mentioned earlier this famed Turkish dish is a staple and daily meal here. I like pide especially with meat topping. I made pide at least once in week for our dinner or lunch. Generally we eat pide with simple salad like mix of lettuce, tomatoes, green onion, olive or other vegetables, with simply olive oil, salt and lemon dressing. Or sometime with Ezme (similar to meze). Also to complete the whole dish we serve Ayran for the drink. I like galette. No.. I love it! Especially fruity galette for dessert. The combination from flaky buttery crust and fresh fruits as topping is my number one list for my afternoon tea time. And also it's perfect for our after dinner dessert cause it's fresh and light. Mostly I serve it with yummy creamy kaymak (Turkish clotted cream), but sometimes with simple vanilla ice cream. Or you can serve it with whipped cream, YUM! Beside sweet galette for dessert, we can make savory one as well with vary of topping, my most fave is cheese combine with any vegetables and sausage. 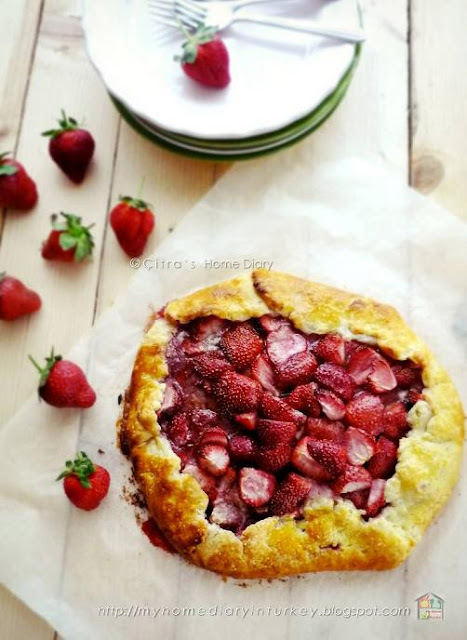 But today I want to make strawberry galette. I already made my homemade flaky pie crust a day before, so it's gonna be easy to go. You can check my recipe for flaky pie crust here. But feel free to use you own pie crust recipe. Another idea is you can use pastry puff dough as well. Börek (Turkish pronunciation: [bøˈɾek]; also burek and other variants) is a family of baked filled pastries made of a thin flaky dough known as phyllo (or yufka), found in the cuisines of the former Ottoman Empire. A börek may be prepared in a large pan and cut into portions after baking, or as individual pastries. The top of the börek is often sprinkled with sesame seeds. I bought some bunch of leek from farmer market a day before, so today I make another Pırasa Böreğı or Turkish Leek Pastry börek. Pırasa means leek in Turkish. It's a börek filled with chopped leek. Different from my previous leek borek, I make this börek with sauce or in Turkish we call it terbiye. This sauce makes börek soft so gives such a chewy texture on phyllo sheet, just like my husband's prefer. Making this börek is very easy than you think. Just prepare your yufka phyllo sheets, brush it with the sauce, sprinkle with filling, roll then slide to oven. That's it. 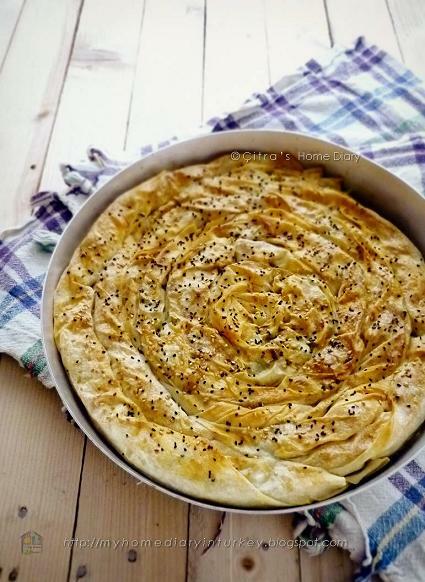 Serve this börek with salad and ayran drink. Mostly I serve with light soup or çorba as entree.